How is your weekend going? Hope you have some time to enjoy this mild weather (in the mid-west anyway)! Our East Coast stampers have been going through some wicked storms … we can all be happy that Spring is on it’s way. I’m behind in my posts … so I’m busy working at catching up! 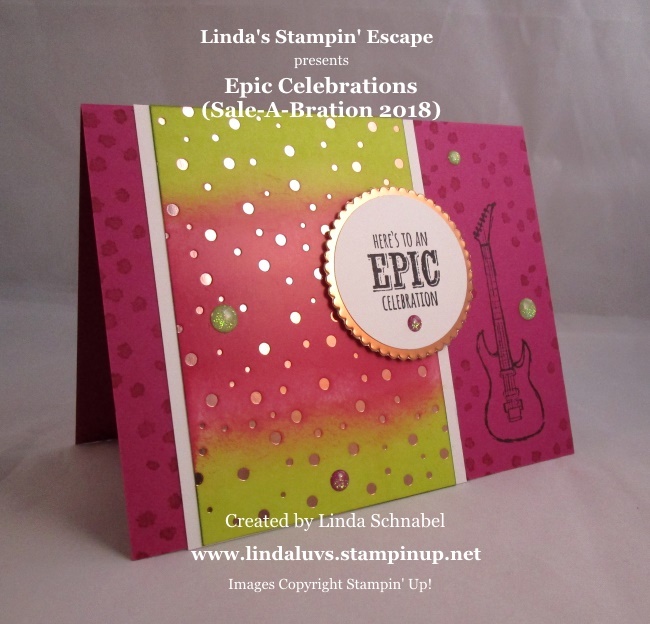 I have my “Epic Celebrations” card for you today! 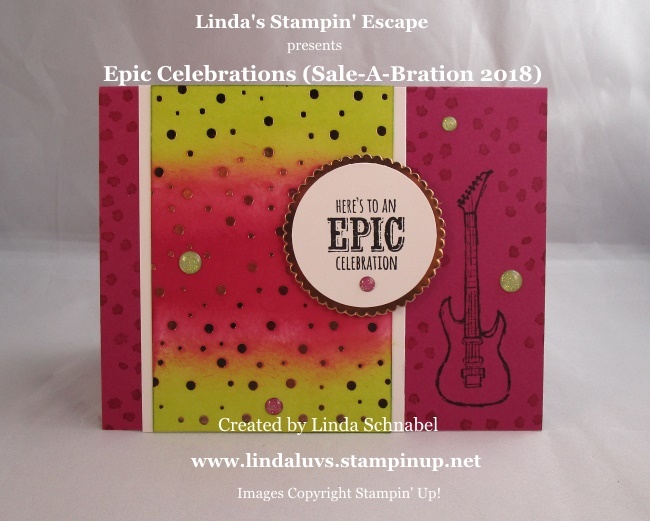 It’s a simple card that highlights not only the Epic Celebrations stamp set but Springtime Foils Designer Series Paper …. I started with the Berry Burst cardstock on which I stamped the guitar and the dots. Then I took the Berry Burst and Lemon Lime Twist ink pads and sponged the colors onto the Springtime Foils Designer Series Paper. It not only has the foil dots but is a glossy cardstock so sponging works beautifully! The greeting was stamped onto Whisper White and is matted with the Copper Foil sheets found in the Annual Catalog before popping it up onto the card. I just couldn’t resist a little more color pop so I added the Glitter Enamel dots … it adds some dimension and a whole lot of fun!! Tomorrow I’ll be sharing another “Epic Celebrations” card which will highlight the New Brusho!! Hoping you have a wonderful Sunday.